We always like the opportunity to play a bit of video poker and there’s plenty of choice out there for those looking for a temporary alternative to online slots. 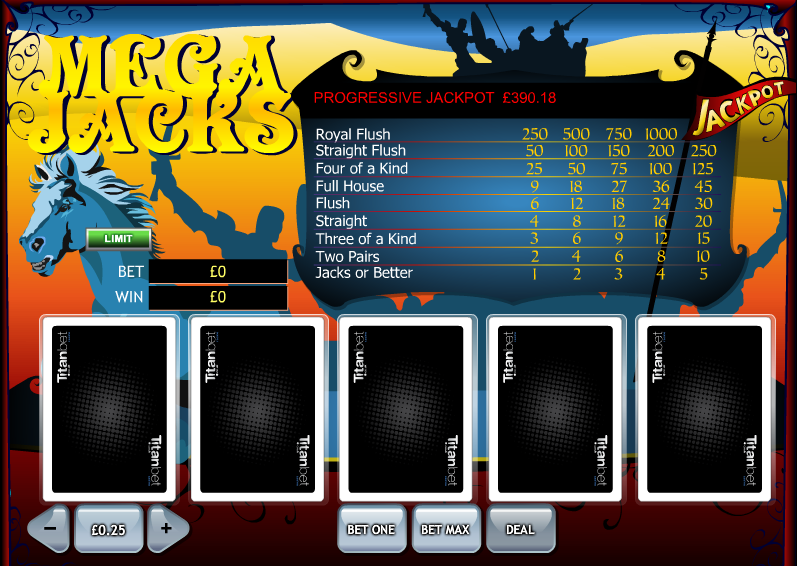 This one’s called Mega Jacks and it’s from Playtech; you may guess from the title that it’s a version of ‘Jacks Or Better’ video poker in which a pair of Jacks is the lowest winning hand. The added extra here is a progressive jackpot. When you load up this game you will se that there is a vague mediaeval theme of knights and white horses. Your cards are displayed at the bottom of the screen underneath the paytable and it’s only possible to play one hand at a time. The aim of Mega Jacks is to create a five card hand containing at least a pair of Jacks and you will have one chance to discard and replace cards to form a stronger one. To being with select your stake using the ‘+’ and ‘-‘ buttons in the bottom left hand corner; there are also five bet levels as you can see from the paytable and these are raise and lowered using the ‘Bet One’ and ‘Bet Max’ buttons below the cards. Now click ‘Deal’ and your first five cards will be dealt; hold the ones you want to keep then press ‘Deal’ again to receive your replacement cards. Hopefully you have at least pair of Jacks and and yo will be paid out according to the paytable. The big bucks can only be won by playing the maximum bet size for your stake; the jackpot prize will be proportional to this bet. To win you must then land a Royal Flush (10, J, Q, K and A of the same suit). You can attempt to double your win by playing the ‘Double’ game; you must choose a card which beats the dealer to win. This is a perfectly playable version of video poker made better by the addition of a progressive jackpot. There’s a healthy 98.49% RTP when played with maximum coins which drops to 98.11% with less than maximum. Read our video poker strategy guide here.